When I switched from Windows to Mac nearly a year ago the only thing that I really missed from Windows was Picasa, Google’s free photo management software. I’ve struggled getting iPhoto to work the way I wanted it to. I had used it for years and since I take a LOT of digital photos I have a pretty extensive photo library for a non-professional (25K photos, 55GB of disk space that span the past 8 years). Today Google released the beta version of Picasa for Mac and I immediately set about installing it and checking it out. 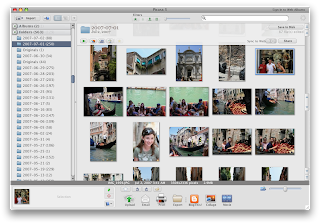 Here are my first impressions of Picasa for Mac. Not long after I created this comparison image I checked it again and the Picasa version is now much clearer. Again, this may be a function of the beta or a delay in the update process for the quality of the thumbnail. You can do many of the same photo retouching jobs that you would in iPhoto with Picasa, though the approach is a little different. In iPhoto you can see a traditional profile of levels; Picasa does not display a profile, just buttons and sliders to manage the effects. One button that Picasa does have is the "I’m Feeling Lucky" button, which will auto-adjust lighting and colors and has an uncanny knack for making pictures look great quickly. In addition the Red-Eye removal tool will first make an automatic pass to try and pick out the red eyes in your photos. Though the automatic mode doesn’t catch everything all the time it does a nice job with the obvious ones, making it very quick to run through lots of night shots. If you have switched from Windows to Mac and used Picasa in the past you will be immediately comfortable with Picasa on OS X. The interface is markedly similar to the Windows version, including the quirky scroll bar that Picasa uses in the main viewing area. If you happened to copy your original photo folders from your Windows machine to your Mac then you’ll be pleased to note that the Mac version recognizes your old settings (tags, stars, descriptions, etc). I kept my files in their original state, simply moving them to the large hard drive I have in my Mac Pro so it recognized everything immediately. The reason I like the idea of having my photos stored on a separate disk and stay there is pretty simple: I share my photos with the rest of my family. So I have a 1TB data drive that has a Photo folder and within that are sub folders for the year / month-day that I took the pictures. This Photo folder is then shared on my network and my wife and kids can get to it easily if they want to grab photos and place them in Facebook, etc. Even my son, still running Windows XP, can get to them. 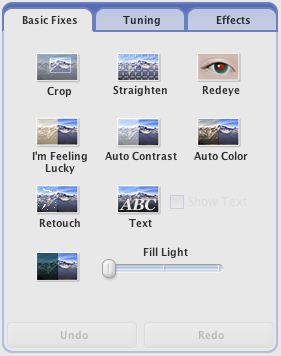 If you edit a file in Picasa (adjustments, red eye, etc.) the new version replaces the old version on your hard drive. A hidden folder is created under the folder where your originals are contained. This folder (labeled .picasaoriginals) contains a .picasa.ini file and the original copy of your picture. Again, this is hidden so unless you have enabled the ability to see hidden files in the Finder you will not see them. 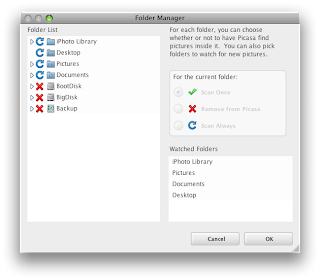 Just select the folders you want to monitor, set it to Scan Always and you don’t need to worry about importing the pictures into Picasa; all you need to do is copy the pictures from your camera over and they will automatically be picked up. There are a couple of things about the Picasa UI that take getting used to. First off, double clicking on a thumbnail pulls up a large view of the photo. If you then click and hold the mouse button it will zoom the photo to 100%. When the image is zoomed don’t expect to use the scroll wheel to move around within the image like in iPhoto; in Picasa that will jump you to the next or previous image. If you want to scroll around in zoom mode you need to click and drag or use the thumbnail viewer to position the viewing area. A single click pulls you back out of zoom mode. Even with the little zooming quirks this method is FAR superior to zooming in iPhoto; the only way you can zoom in on the current version of iPhoto is to place the photo in Edit mode. The software is still in beta so there are problems; as an example when I tried to remove a folder from Picasa (Right Click, Remove from Picasa…) I got the spinning beachball of death and had to Force Quit Picasa. That said, having played with it for several hours I was comfortable with it pretty quickly and am looking forward to using it more in the coming days. If you decide to give Picasa for Mac a spin note that it only runs on Intel based Macs; PPC based Macs are out of luck. The Picasa for Mac Forums are also an excellent resource for getting questions answered.